Best accumulator bets and how you can profit from accas! Matched betting allows you to profit every single time you place an accumulator bet! That’s right, you can place football best accumulator bets online and guarantee yourself a profit before any of the games kick off! To a £50 stake, you can generally expect to make £8-£10 profit which is superb as you can do as many of these as you please over the course of a month! The largest number of football accumulators I have placed in a single month is 269! Yes two hundred and sixty nine! This was back in March when I had my legendary month of earning over £4k! The beauty of these types of accumulator bets is that it doesn’t require you taking advice from a tipster. There is no need for accumulator tips nor football accumulator tips at all! This follows on from the very basics of matched betting by laying the same selection at a betting exchange. For me, matched betting on accumulators is the best accumulator bet you can ever place! On a typical month, I would place around 120 football accumulators and take a profit of every single one. I use a premium matched betting service called Oddsmonkey which will find me the most profitable football accumulators to place at the very click of a button. When I press the refresh button on their amazing software, it will scan all the bookmakers’ odds and compare them against the current exchange lay odds to come up with the best combination of football teams so that you maximise your profits! When placing football accumulator bets, most bookmaker offers out there require you to select 5 selections and they will refund your stake as a free bet should just one selection lose. To profit from this offer in matched betting, we must have the 5 selections kicking off at different times. Thankfully, the accafinder is programmed to find accumulators where the 5 different selections are kicking off at different times so this saves you so much time! The accafinder literally does all the hard work for you! This accumulator above was an accumulator I placed back in May 2017 and to the £50 stake with William Hill, I managed to make £36.06 profit no matter what the result was in the final leg of my accumulator between Juventus and Crotone. I must admit without Oddsmonkey’s accafinder tool, it would take so much of my time up as I would be forever working all the combinations out manually which can be very time consuming. 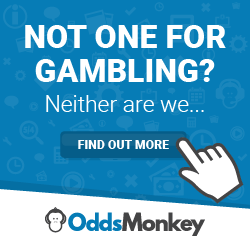 Each month, it makes business sense to pay Oddsmonkey just £15 a month to be able to use their fantastic software. Time is money and you shouldn’t really be spending so much of your time manually looking for the best accumulator bet to place just to save a miniscule £15! Oddsmonkey have also gone to a lot of trouble to produce a very helpful guide in teaching you how to use their accafinder software and all the common pitfalls to avoid! This helped me out when I first started learning how to place football accumulator bets because I found them very complicated to do. The software also enables you to set up email alerts so that you know when to lay the next leg of in your football accumulator bet. This is what catches a lot of people out, they place a football accumulator bet and forget about it. They will lay the first selection off and then forget about the rest which can be very costly and dangerous! This is more gambling and I wouldn’t avoid it at all. If that is your preferred approach, you might as well follow a football acca tips facebook page! I always use the lock-in method when placing football accumulator bets at Oddsmonkey. This method guarantees a profit every time and I recommend using this method. The other methods that are available on the accafinder tool are riskier and better suited for those seeking a better payout from their accumulator bets. I prefer to profit every time and that is what the lock-in method enables you to do. Have a read of my impartial Oddsmonkey review today! To keep on top of the football results, I use a very handy app called “Flashscores”. I downloaded this from the app store and this really is a godsend! After I have placed an accumulator bet, I will look on my phone and search the teams I have just selected and then press the “star” button next to them so I will be notified of the result in the game. This then allows me to update the result on the accafinder tool and then see how much money I need to lay on the next selection in my accumulator. The app can be downloaded by clicking here. These are my accumulator tips so that you stand every chance of becoming successful at profiting from football accumulator bets in matched betting. This is so important when it comes to doing matched betting with football accumulators. You will need to know what the scores are in order to be successful at profiting from the accumulators you place. If you use the flashscores app as mentioned above, you will be kept up to date of the football scores and you will also be notified of games that kick off 3 hours in advance, giving you plenty of time to get your next leg laid off in time. Use Smarkets where possible. When you first place football accumulator bets at the bookmakers, the accafinder tool may say Betfair as the exchange. You can change this to Smarkets later down the line once the games prior to that game have settled. This is because the 3% difference between Betfair and Smarkets will really add up over time! Ensure your bankroll is big enough. This can catch some people out. For example, if you place a £25 accumulator bet at odds of 4.0, this will mean you need altogether £100 in order to be able to lay each successfully. Of course, placing just one accumulator will be easy to manage but when you have 30 accumulators all due to settle in the same weekend, this can catch you out if you’re not careful. I once had 95 football accumulators due to settle on the same weekend and required me to have £22,000 to be able to lay each one of successfully which thankfully I did have. Always read the terms and conditions. Oddsmonkey have done a great job by listing the terms and conditions of the bookies’ offers on their website on the accafinder tool. However, it is good to double check and read the terms on the actual bookmaker’s website so that nothing can go wrong. Double check the football accumulator bet you are placing. With all the many football games that are available to bet on and sometimes the same teams can be playing each other twice in a short space of time. This is because of league and cup competitions. Before you place the accumulator bet at the bookmaker, double check the teams you have selected and make sure they match the teams listed on the accafinder tool. If they do, place the bet at the bookmaker website and then lay the first selection of at Smarkets. So if you are looking to make extra cash from matched betting and concerned that once you have completed all the sign up offers, there are no more offers to do. You are wrong. You can do many football accumulator bets and profit from them every time. You can easily place 20 a month which will make you an easy £100 a month! This may not sound a lot but that’s with very little effort, many people in jobs would love to make an extra £100 a month for 3 hours work outside their current job. If you have never placed a football accumulator before, it is best you join Oddsmonkey and watch all their tutorial videos regarding accumulator bets before you place one. When you’re happy with the tutorial videos, just place one football accumulator bet via the accafinder to see what they are like. They are more complicated than other tools in matched betting but they are so worth doing because the profit of each football accumulator you do will certainly add up and give you extra income each month. Before you go have a read of my Smarkets review today as well! Doing football accumulators using the process of matched betting really is the best accumulator bet you can do! The only sure bets are from the signup offers. Dude. This is a great post. Thanks for.putting it together. I done the whole match betting thing last year but then like most packed it in after going through the majority of the sign up offers. Your YouTube videos have made me rethink and want to get back on board with it. Going to give the accas a go mate. Thanks again for posting these guides and tips. Seriously, spot on mate. Hi Adam great site and You Tube videos. I’ve done a few lock in Accas now, the last 1 did was £20 William Hill the lay odds on 2 of the matches had dropped significantly since the Acca was first set up, the Acca finder on Oddsmonkey said I made £21 ish profit, £16 would be from the free bet as 1 leg lost and the other fiver from the change in lay odds I assume. This almost sounds too good to be true or does the change in lay odds really have a bareing on the profit level of the Acca? Brilliant stuff Corkie, thanks for taking the time out to do all this. Invaluable info. Thanks Sarge! I hope they help! Just found your website. Great info on Acca. I’m still doing sign ups via Oddsmonkey but definitely going to give this a go. Thanks for the help. Very interesting post. How do you find the extra time to always for the lock in method though? Personally I always no lay as the time saving and extra profit are worth it for me but can understand the variance can be off putting to many. Being organised is so important with the lock in method. Best site for football accumulators and how to profit from accas!